Typically when we think about business and marketing, we think about adding and optimizing stuff, not eliminating. However, the process of removing things from our plate is just as important. Pruning your service offerings opens up room for more of your favorite projects. Deleting things that no longer represent your best work highlights the kind of work you want to be known for. Giving up certain marketing practices you take for granted enables you to try out something new that might work even better. Not all marketing tactics are suited for all people, and no matter what the “experts” say, not all of them will work for every business. Most marketing tactics are a long term game – it will take months for them to work, and there's no need to keep up with doing something “until it works”. 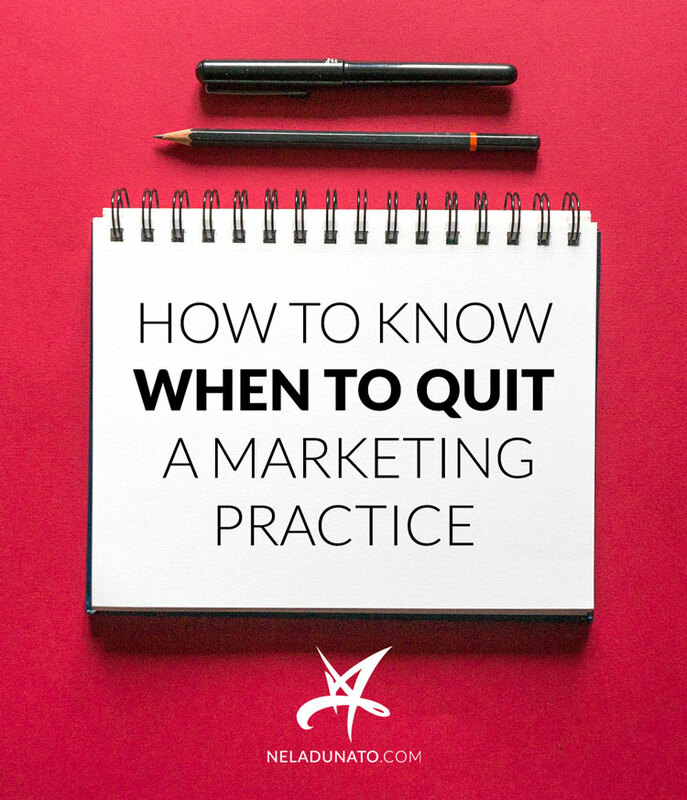 You can find out fairly soon, after doing it consistently for 2-3 months, if the marketing practice you're doing is right for you. The way I propose is so simple it hurts. 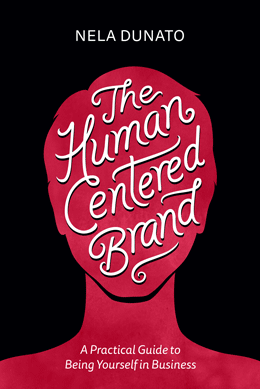 My philosophy on marketing for creatives is that it should be treated as an art form. By that, I mean that we need to explore marketing practices that bring us a sense of fulfullment, regardless of whether they bring in business, because that's when we're at our best and make the biggest positive impact on our audience. I explain this approach in detail in my post Marketing is an art form: Creative rebel’s guide to self-promotion. With so many different options available to you, there's no need to stick with something you don't like doing. Marketing only works if you do it consistently – the best way to ensure you'll stay committed is to pick something that's fun. There's a learning curve with all new skills, so maybe you won't like something from the start – for example, it took me a while to start enjoying writing newsletters (it was fairly awkward at first). That's why I said you should give it an honest effort for 2-3 months. That should be plenty of time to get over the initial discomfort, and examine what your actual experience is. How to know if your marketing works? The purpose of marketing is to attract new people into your world, who will then buy your products or services. The only valid metrics to how effective a marketing practice is are the number of leads and sales you get. Leads are the people who express interest in buying from you by sending an inquiry, signing up to your email list or calling you on the phone, and leave you their contact information so you can send them relevant offers tailored to their needs. Your social media followers are not leads. Your website visitors are not leads. 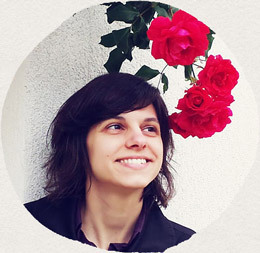 People who follow your blog are not leads. People who favorite your items on Etsy are not your leads. Maybe you can convert some of these people into leads, but the majority of them is not there to buy from you, and never will. If your goal is to earn money doing what you love, growing a huge following that will never, ever buy or recommend your stuff is a waste of time. Sales are straightforward – when money exchanges hands, you've made a sale. Sales are typically measured in currency, so the number of people who’ve bought doesn't matter, the dollar (or euro) amount does. Service providers typically don't need many clients, since they can only work with a limited number of people at a time. One client that spends a lot of money with you, and then continues to come back for more services, is more valuable for your business than having many one-off purchases. An effective marketing practice will attract people who are the right fit for your services and products, your style of work, and your personality. A practice that doesn't work will either not attract anyone, or will attract the wrong type of people: those who don't value or need your work, or those who hire you and then aren't happy with your service (or you're not happy working with them). 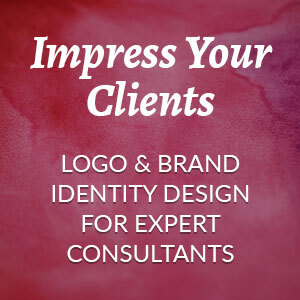 Keeping the wrong type of clients out is just as important as inviting the right people in. Now that you know the definition of effective marketing, it's time to decide what works, and what doesn't. I think in visuals, and graphs are one of my favorite ways of making decisions. 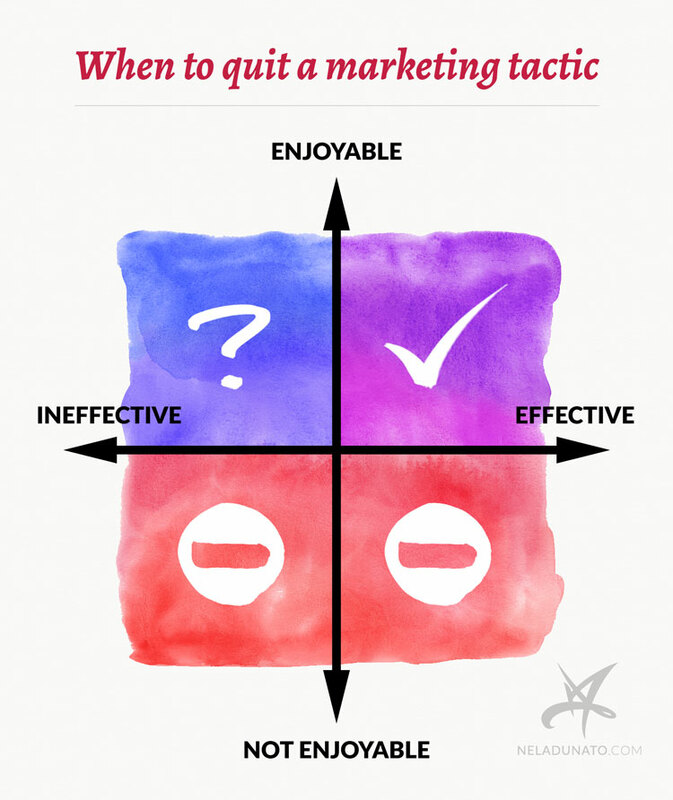 Below is the graph that outlines marketing practices on a spectrum from ineffective to effective, and from not enjoyable to enjoyable. Right now, get a sheet of paper and draw this graph. I'll wait. List all the marketing tactics you've been using (no matter how often), and I do mean all of them – content, social media, in person, print advertising, etc. If there are several different ways you use a social media channel, break it down into specific activities, for example: posting on my Facebook page, chatting in Facebook groups, scheduling blog posts on Twitter, interacting with Twitter followers, etc. Mark in which quadrant each activity falls into. If you're not sure, guess – you can go into detailed numbers if you really want to, but this exercise is based more on how you feel about doing a particular task. When you're done, read the explanations below. 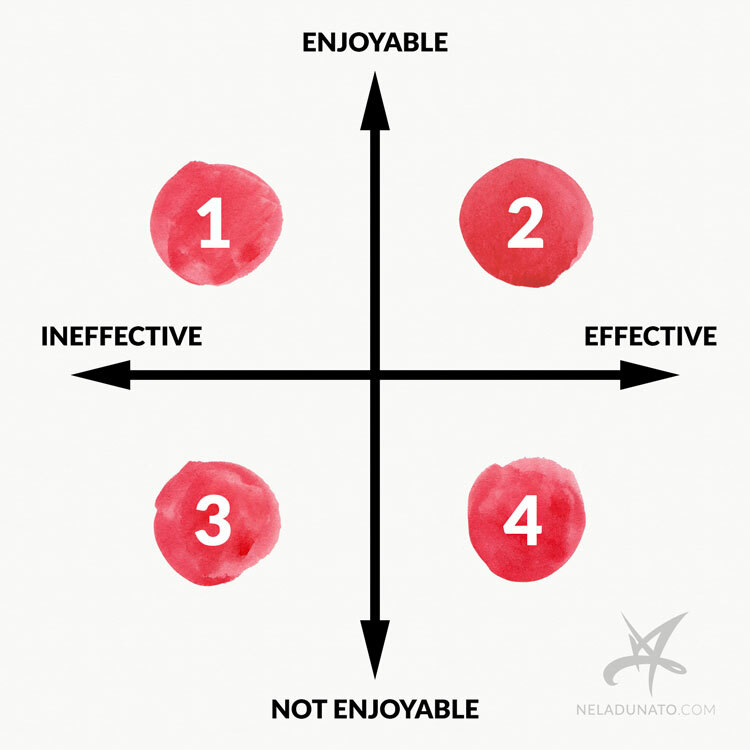 In the first quadrant are activities that are fun and easy, but don’t bring in many (or any) new clients or leads. You might be having a blast creating videos, and get encouraging comments, but it doesn’t lead to anyone buying. Maybe you just haven’t been doing it for long enough. Content marketing typically takes a really long time to work. People need to go through the process of meeting you for the first time, learning about your work, growing their trust in you, and then one day when the stars are right – finally deciding to give you money. This journey can take years. I’m not exaggerating. Yay, you’ve struck gold – you’re doing what’s fun, and it’s bringing in money. It almost sounds too good to be true. Congratulations, just keep doing it! I can’t tell you how many times I’ve stopped doing something that was working because I habitually seek out new things (as creative people often do), and then stopped getting all the clients, money and media attention. This is a hard lesson for novelty-seekers out there: do more of what works. You gave it an honest try. You’ve read some information on how to do it better. You tried to adapt the practice to fit your personality and strengths. After all that effort, it’s still not working, and it feels like a chore. You have my permission to give it up. Seriously. No point in working yourself into the ground. You didn’t start this business so you could do chores all day long. Yes, running a business is hard. Sometimes the things we need to do are unglamorous. Sometimes you’ll feel like you’d rather stay in bed than do all the things on your to-do list. That’s all normal, and I’m not talking about that now. What I’m talking about is when that activity that you’ve been continuously doing for months now feels like it’s sucking your time and energy, and blocking your progress because you’d rather spend that time on your new creations. It’s the activity that you secretly wish you’d never have to do again. No, you really don't need an email list. I know, shocking! After all you’ve heard from marketing gurus who say “the money’s in the list”, it may seem hard to believe, but people have been successfully running their businesses without a list for thousands of years, so you should probably be fine without it. The internet is just a tool like any other. Yes, it can help you grow beyond the boundaries of your local marketplace, but there are about a million different ways you can do that. So do what you do well with even more energy and passion. Maybe in a year when things have changed, you find that you’d like to try it again, and this time it turns out better. Take a step back and see what your marketing strategy would look like if you didn’t have that thing weighing you down. Where would you put in the extra effort? What new things could you try? And lastly, let's examine the especially tricky one. Here we have a “golden handcuffs” situation. The activities obviously work because leads and clients are pouring in (or at least, trickling in), but you hate doing it. Maybe it feels like a chore (see above). Maybe this tactic goes against your core values. You feel icky every time you do it, because deep down you feel like you’re doing it only because of the promise of big results. You’re going into it with an agenda, not because you feel like you’re genuinely helping people. In any case, you’re afraid to stop because if you do, the results you’re getting might go away. You fear losing what you already have. This is a real risk, and I won’t pretend that it’s an easy decision, but I’ll tell you one thing: the difficult decisions are what makes a difference. Each time I did that, it felt like I was missing out on something, losing a small part of myself. But the very next day when the initial impressions have settled down, I've felt relief and elation. I knew that saying “no” to some things enables me to say “yes” to what I really, really, really want. Whatever results you’re getting, if you feel like you’re losing a part of your soul every time you do it, it’s not worth it. I know how difficult it is for you to make the right decisions for yourself when you're surrounded by a myriad of conflicting advice. I often fall into the trap of accepting “the ways of the world” instead of following my own truth (which is why I regularly take online media sabbaticals to clear my mind). Going against the grain is scary. A lot of us have childhood trauma about standing out from the crowd. As simple as it is, my suggestion to quit doing stuff you don't like is likely pushing your “nice person” buttons. You may be wondering “Am I really allowed to do that?” Yes, you are. Even if it goes against your mentor’s advice. Even if your readers or followers will be disappointed. Marketing only works if you do it consistently – the best way to ensure you'll stay committed is to pick something that's fun. Running a business takes a ton of time and energy. Each and every day, you could be doing a million different things to grow your business, and you need to carefully choose those that have higher odds of working in your favor long-term. You won't get a medal for enduring with something you dislike. If you feel like you need more time and energy to do what matters the most to you, here's your opportunity. 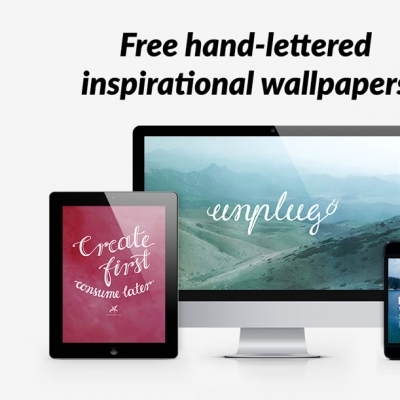 Ditch everything that isn't working for you, and see what new ideas will emerge. I'm sure that whatever you come up with when you're energized and inspired will be so much more effective than any “best practice” out there. If you'd like more help with figuring out a marketing plan that works best for your personality, talents and ideal clients, download my free Authentic Promotion Guidebook that takes you through an easy step-by-step process. 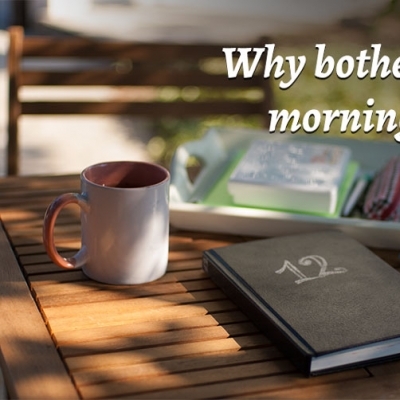 Why bother with a morning ritual? That is such a good point about giving things enough time to actually work. I've noticed quite often in various Facebook groups that people will say something like, 'I've been doing x for a couple of weeks/a month, and nothing's happening! Maybe I'm doing something wrong/should give up.' But in my experience it takes WAY longer than you think it will, and usually there's some kind of tipping point where, after a long time of feeling like nothing's happening and being worried and frustrated, suddenly the numbers start increasing with much less effort, for example. @Tara: Well said, that's been my experience as well. Months go by and it feels like a ghost town, then suddenly something shifts and whoa - results? I totally agree with you! It's a long game, and let's make it a fun one.